School is only days away, and my mind is already excited for the first day. I love meeting all of the young people I will be teaching and guiding over the next ten months. Any teacher will tell you, though, that the hardest part is learning all of their names and getting to know all of them individually, all while getting through the curriculum. 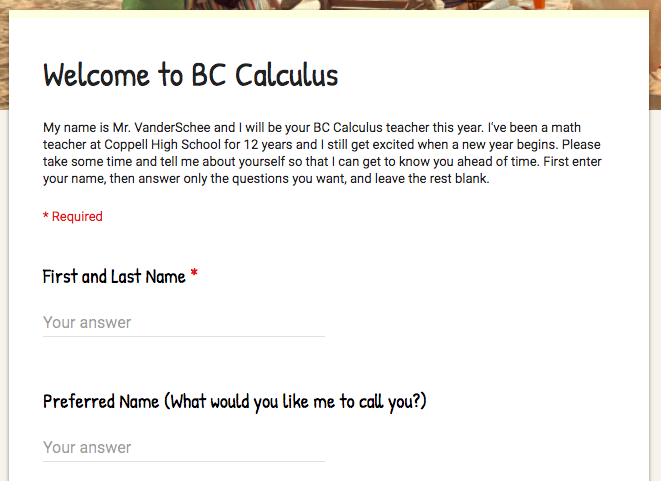 A few years ago, a colleague of mine developed a survey to give to students, in order to learn more about them: what they like to be called, what math course they took last year, what activities they are involved in, and what their personal interests are. I used this survey for a few years, and this year, I decided to make my own. 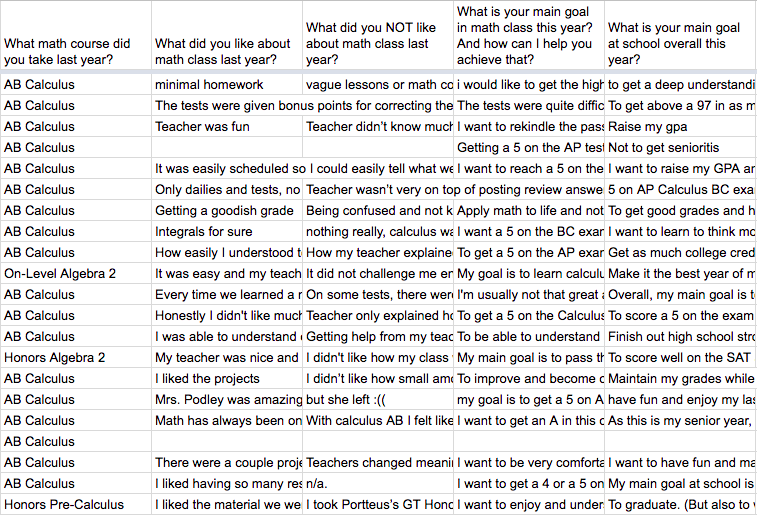 I asked a lot of the same questions, but added some new ones: what is your main goal for math class this year, and what is your greatest obstacle in math class. I send out the survey as a Google Form and use a spreadsheet to track the results. This accomplishes a lot of things. First of all, it lets me know quickly the varying levels of math background the students already have. Specifically in my Calculus BC class this year, I noticed that while most students have finished Calculus AB, there was one student who took Pre-Calculus last year, and two who took Honors Algebra 2. So before the year begins, I already know I’m going to have some conversations with these students, and possibly their parents and counselors, to let them know the level of knowledge and rigor that is expected in Calculus BC. I also know that when certain Calculus topics come up that require skills that they were not exposed to, I will have to give them some resources to get them to the same level as their classmates. I was also fascinated by their varying goals. Some were focused on grades and GPA, while others just want to learn calculus, or just enjoy math. Personally, it worries me when someone’s goal is grades or GPA – it’s like saying my goal in life is to have a lot of money – I worry that they don’t care how they accomplish that goal, even if it involves dishonesty. But I have to give them the benefit of the doubt: maybe they just haven’t really thought about what goals are supposed to look like. What I mean is, a goal should be to learn, whereas a high grade is a consequence of achieving that goal. Similarly, a worthwhile job is a goal, whereas money is a consequence. As I look at the results, I now have a lot of information about my students before day one, which is to everyone’s advantage. The survey itself is great, but I’m the only one who benefits if I stop here. So now comes the fun part. I write an email to each student and personally welcome him or her to my class. I comment on their responses, especially if we have something in common. For example, many of them are involved in a school music program, and I’ve been playing piano since I was 7. If we have nothing in common, I look for responses that I could talk to them about. Many of them are involved in activities outside of school that I know little to nothing about, and I want to learn. I tell them this in my message to them. The whole process is very simple, and even though it takes time to write all of those emails, the student knows that he or she is a welcome and valued member of my class before walking into my classroom on the first day. The relationship has already begun and is already meaningful before we ever shake hands and say, “Good morning,” for the first time. Posted on August 10, 2018, in Flipped Classroom. Bookmark the permalink. Leave a comment.